Now doesn’t that sound so zen? Unfortunately, I’m nowhere near the path to enlightenment. What I really mean, without the pretentious zen-wannabe tone, is that in order to create cute figures in your food, you have to look hard, consider their shapes and unleash your imagination. Stare at your food and imagine what it shapes like. Two burger patties beside each other can be the beginnings of a monster. Half a katsu could be a creeping mouse. Slices of fishcake can be a dragon. Did you ever stare at the clouds when you were a kid and imagined what shapes they made? It’s just like that. You need to consider the basic shape, imagine, then help it out with additional accents. Even simple shapes like circles and ovals can be interesting once you figure out what you can do with them. At times, you can make your own shapes as well, like with this bear-shaped burger. Store-bought food can also have fun shapes already, like those chicken nuggets with fun letters and animal shapes, or these fish-shaped fish nuggets. Whether it’s a deliberate shape or accidental, just remember to help it out with accent cut-outs. In this case, I used nori, cheese, or and thinly sliced tomatoes. Other food items like ham and cold cuts, cucumber skin, spring onions, and peppers are all excellent accents as well, thanks to their bright colors. All you need are the accent ingredients, a sharp knife, and your imagination. May I know where you buy vegetable cutters? I think it saves a lot of time I’ll try duplicating the panda rice (may I?) and hope it turns out fine. * Sorry if my question was already raised/answered in the past. Every bento box tells a story! Congratulations on your nomination. I do hope you win the award. This is my first time here but it is a great blog. I love food and I love to eat. I can see myself coming by here often. 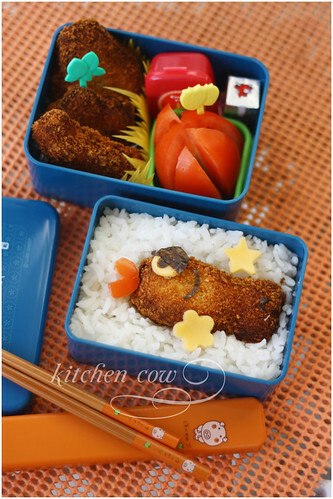 Along those lines, I think what would be beneficial to making cute bento would be understanding simple drawings. When there is a bear, what shapes make it? Usually three circles, one larger than the other two. So to use these basic shapes in food, we need to understand very elementary drawing/sculpting designs. I think your dragon creation is excellent, and I would have never though of something like that. When I see a dragon, it is hard for me to dissect the beast into its fundamental shapes. Your designs are simple yet very creative. Good job! Of course you may! Please do, we’re all in this to inspire each other, right? The vegetable cutters, I got from a nearby Japanese grocery. There are some on ebay but they’re a bit pricier, having ebay prices. And this one goes FISHIEEEEEEE! Well, you can always use more than one, or get a bigger box 😀 I hope you don’t let the size of the box stop you from packing lunches. You’re so right! I’m not an artist so in my case, it helps a lot to look at simple picture books and at other people’s creations. But when you really think about it, they all go back to basic shapes, don’t they?